After leaving Innsbruck we head east towards the city of Salzburg in central Austria. Salzburg is perhaps most famously known as the birthplace of Mozart but it is also renowned around the world for its baroque architecture. 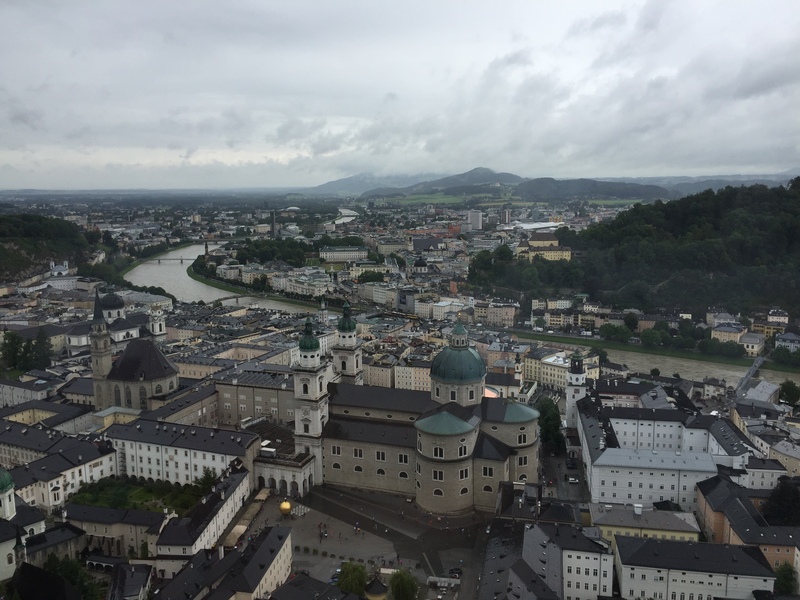 Salzburg was also the setting for the Sound of Music. 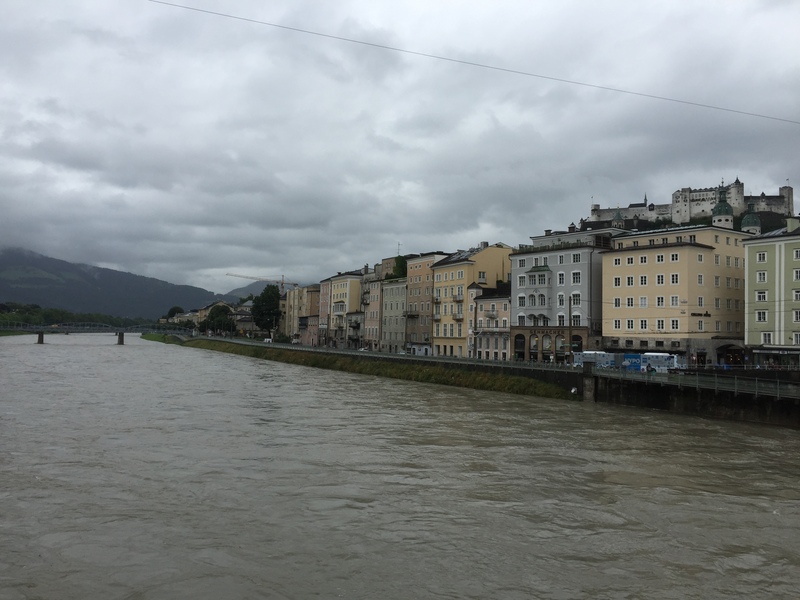 My first observation of Salzburg was that it is a beautiful and picturesque city nestled along a river amid a lush alpine environment. My second observation was that the tight streets, pedestrians, buses, and street cars made it a chaotic place to drive in and out of. Although Salzburg was not the largest city we visited it was by far the most complicated to drive in. The city is divided along the river between modern and historic sections and is dominated by the Hohensalzburg Castle which sits atop a mountain looming over the historic city. View of historic Salzburg as we crossed the bridge from the modern section. Despite driving a few hours away from Innsbruck it seemed like the rainy weather just didn’t want to leave us be. 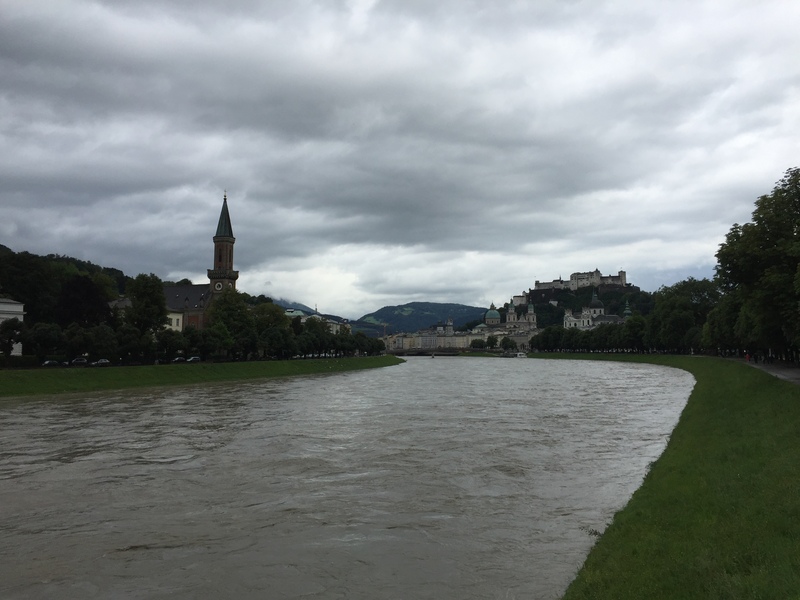 It rained yet again through the entirety of our visit to Salzburg. However, luckily we didn’t plan any outdoor activities in the area and the majority of the historic sites are indoor attractions. 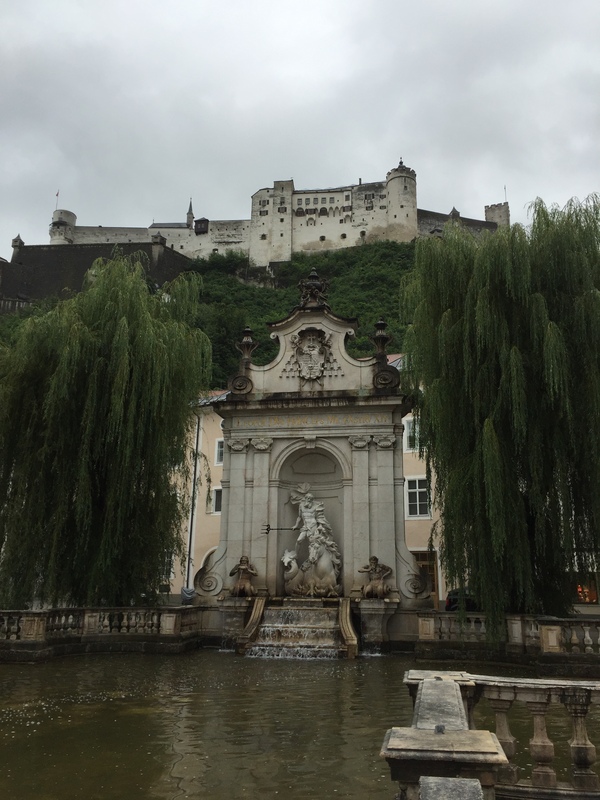 Since we only had one day to spend in Salzburg we focused our attention on the historic city which is a fairly small area with a spiderweb of small streets, shops, and most of the cities major attraction. 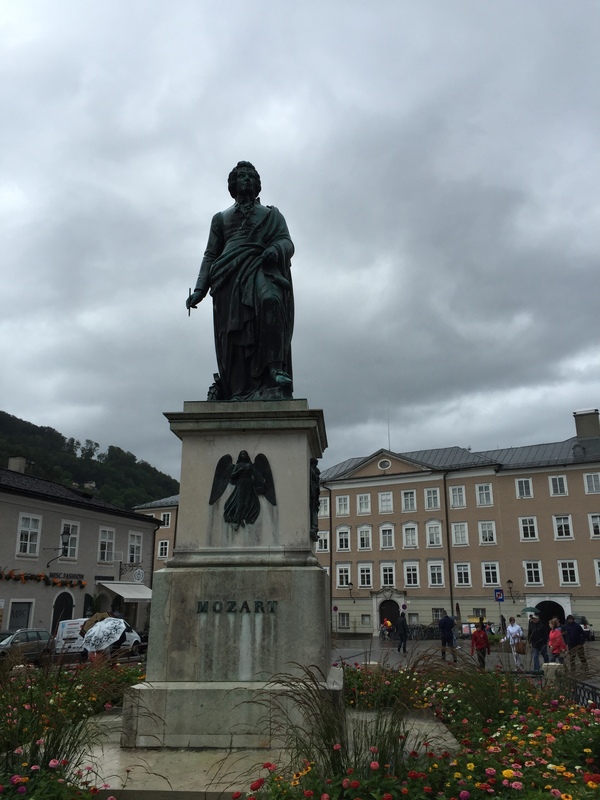 We started our visit in the Mozartplatz which is most famous for a large statue dedicated to Mozart in its center. Adjacent to the Mozartplatz is the Residenzplatz which is a 16th century square dominated by a baroque fountain. 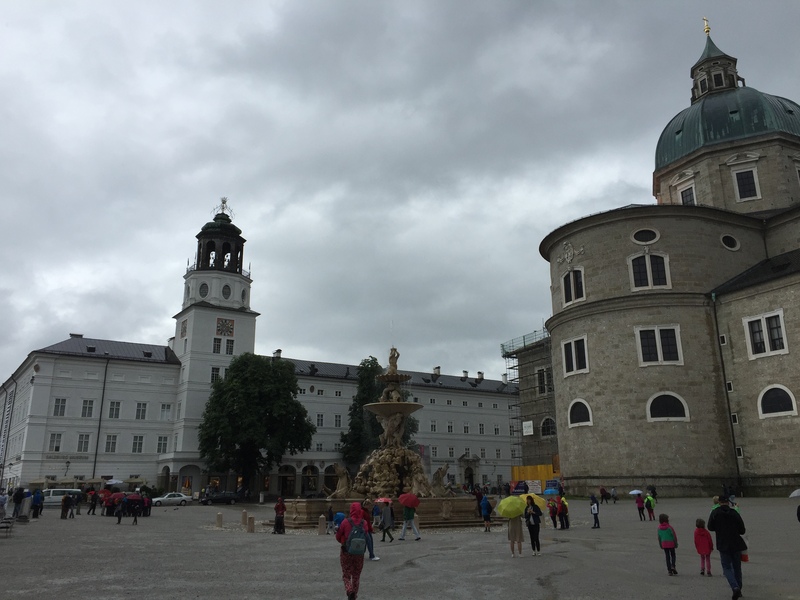 This square is also dominated by the Salzburg Cathedral. The Residenzplatz and baroque fountain. The north facade of the Salzburg Cathedral. 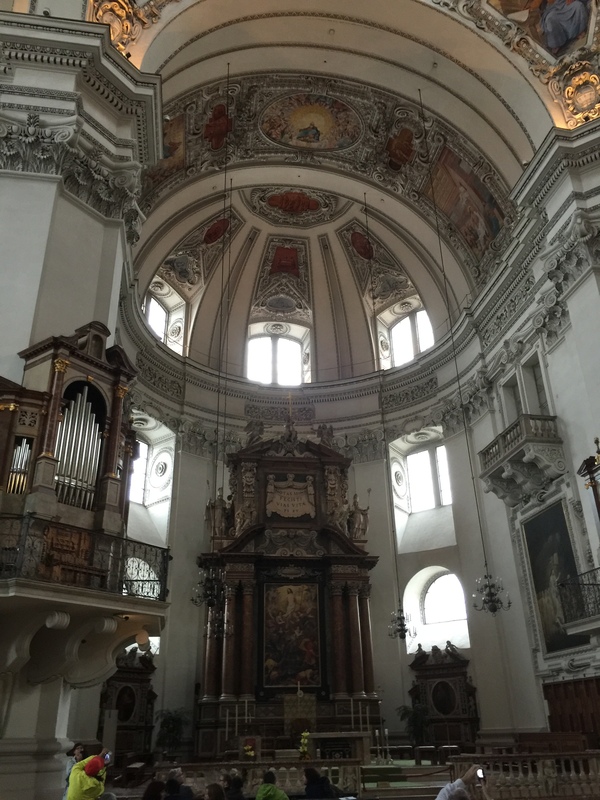 The Salzburg Cathedral is a 17th century baroque cathedral which was originally founded by St Rupert in 774 on the remains of a Roman village. The cathedral was subsequently rebuilt in 1181 following a fire that destroyed most of the original structure. Then finally in the 17th century the cathedral was completely rebuilt by Prince-Bishop Wolf Dietrich Raitenau in the baroque style that you see today. 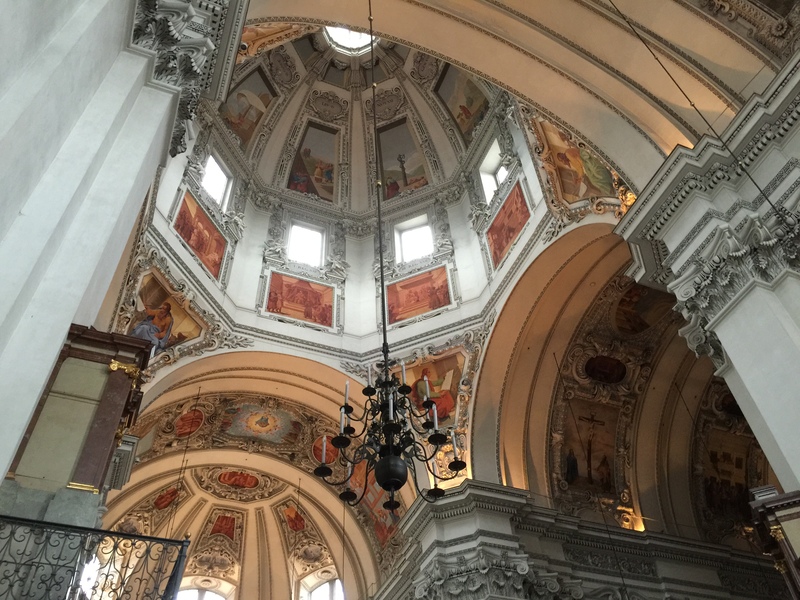 The Salzburg Cathedral is open to the public and I would highly recommend stepping inside to admire the countless works of art and beautiful architecture you can see in every direction. Looking towards the main altar. Looking down one of the side hallways inside the cathedral. Looking up at the central dome. 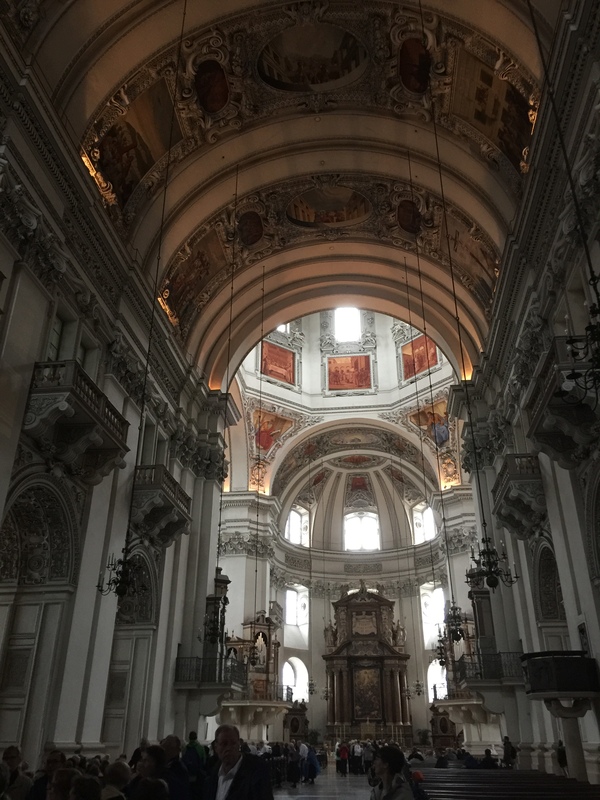 We spent quite a bit of time inside the Salzburg Cathedral exploring its many nooks and crannies as it really is a quite large and expansive structure. While we were there we also made a trip down into the crypts which besides being a burial place for Bishops of Salzburg to this day, it also had some remnants of the original churches which sat on this same location. 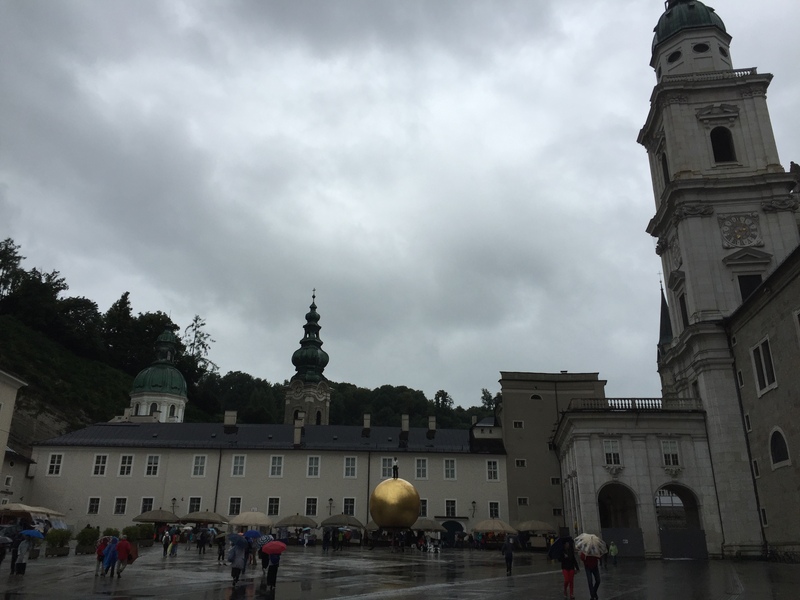 After leaving the Salzburg Cathedral it was already getting later in the day then we would have liked so we decided to make our way over towards the funicular which we had to take in order to reach the top of the mountain and the Hohensalzburg Castle. Before reaching the funicular we had to pass through Kapitelplatz. In this plaza was a large golden globe with a figure sitting atop of it known as “Sphaera” which is a work of art by Stephan Balkenhol. In addition to this piece of art is an 18th century horse fountain built under Archbishop Leopold Firmian in 1732 to plans by Franz Anton Danreiter. This fountain was built in a Roman style and it is even more interesting when you realize this beautiful fountain was intended for use by horses. View of the horse fountain in Kapitelplatz with the Hohensalzburg Castle looming from above. 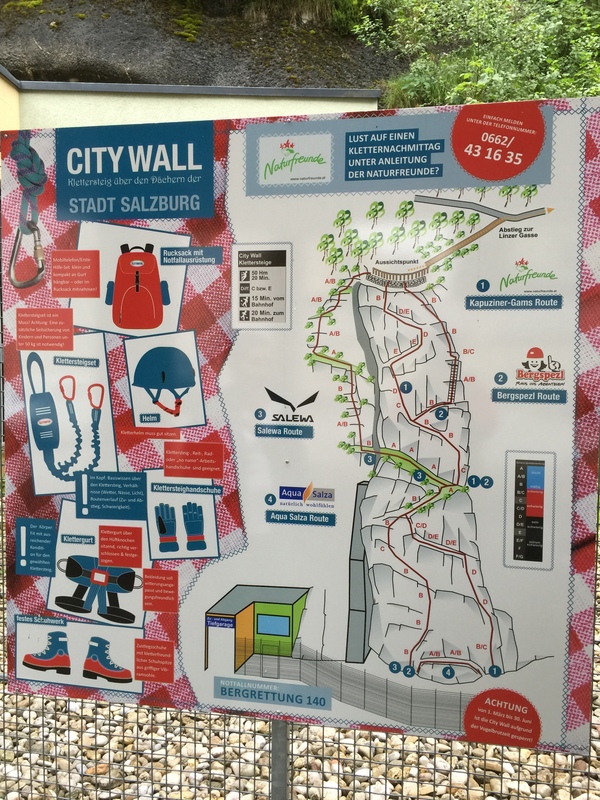 After taking in all of the sites in the Kapitelplatz we made our way over to the funicular which was adjacent to the plaza and near the street vendors (of course!). From here we purchased our tickets and made our way up to the mountaintop castle. The Hohensalzburg was built at the behest of the Prince-Archbishops of Salzburg and began construction in 1077. The castle was subsequently built and expanded on over a number of years before finally falling out of service as a military outpost in 1861. 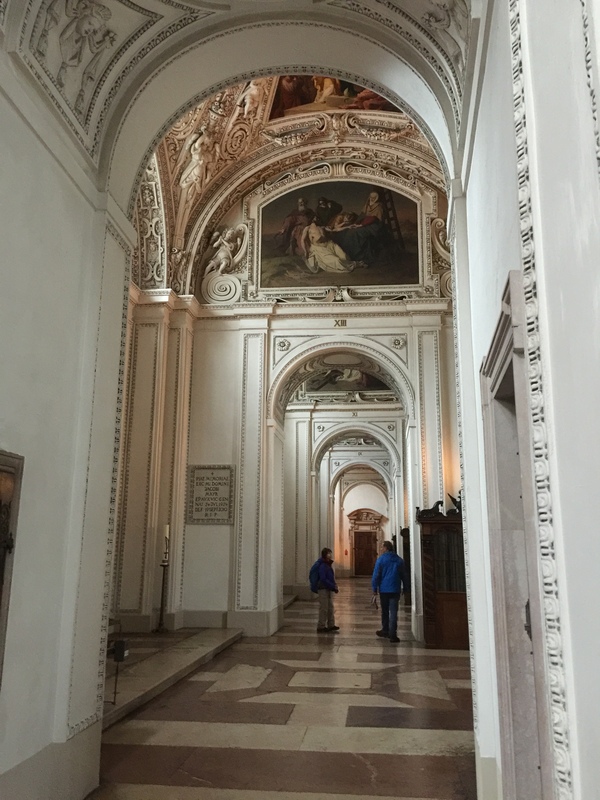 The Hohensalzburg has had a very long and varied history and from its creation played a pivotal role in the politics of Austria before finally becoming a tourist attraction in 1892 with the construction of the funicular. Today the castle is predominantly a museum showcasing a wide range of artifacts from the history of Austria. The castle offers some fantastic views of the surrounding city and countryside. View of the Old City from the Hohensalzburg Castle. I won’t go into great detail on what there is to see in the castle as there are just far too many things, but I will say that you need to make sure you purchase the extra ticket for the “Golden Hall” and “Golden Chamber”. 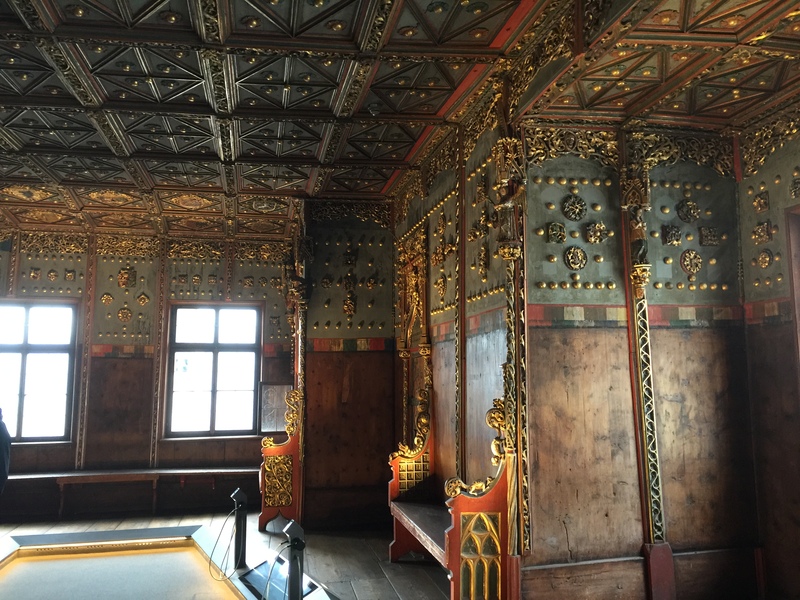 This section is by far the most incredible interior portion of the Castle and a stunning example of 15th century Gothic design. 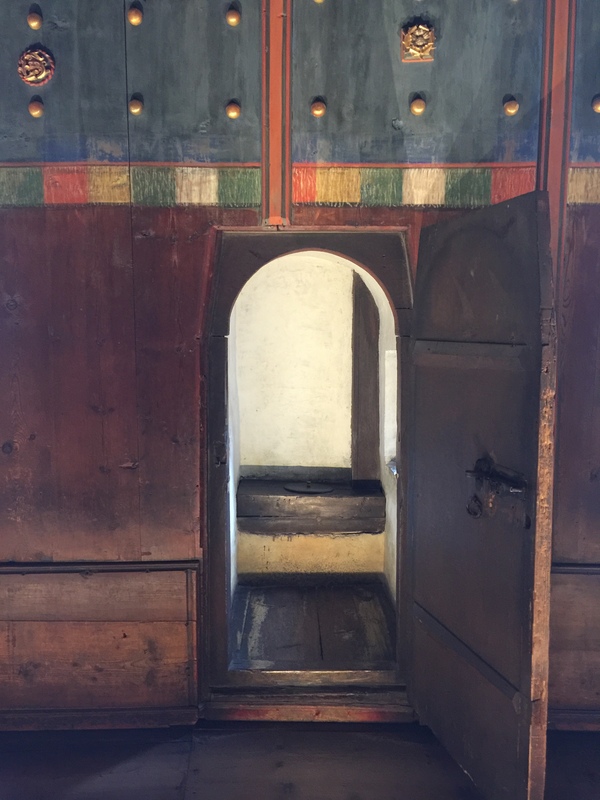 These rooms are particularly important as most private imperial rooms in castles throughout Europe would have been renovated year after year and such well preserved examples of 15th century design just don’t pass the test of time. 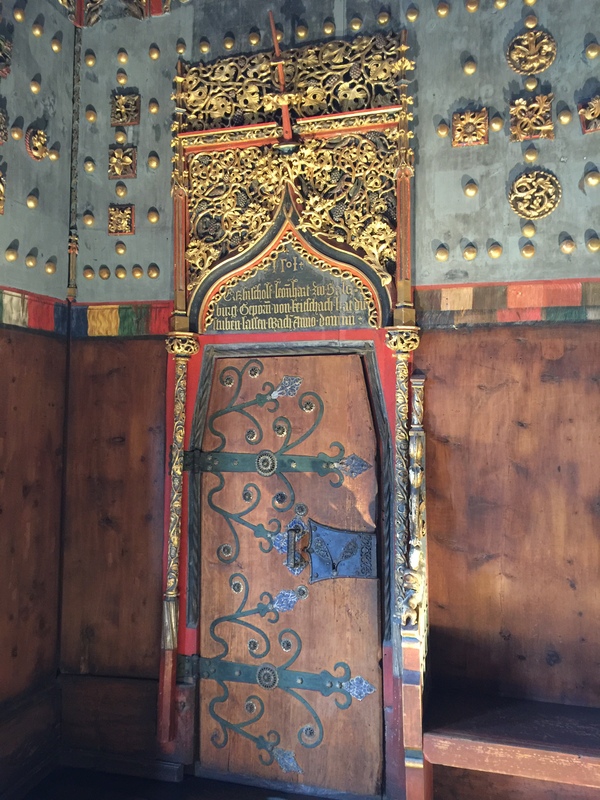 View of the ornate wood work. 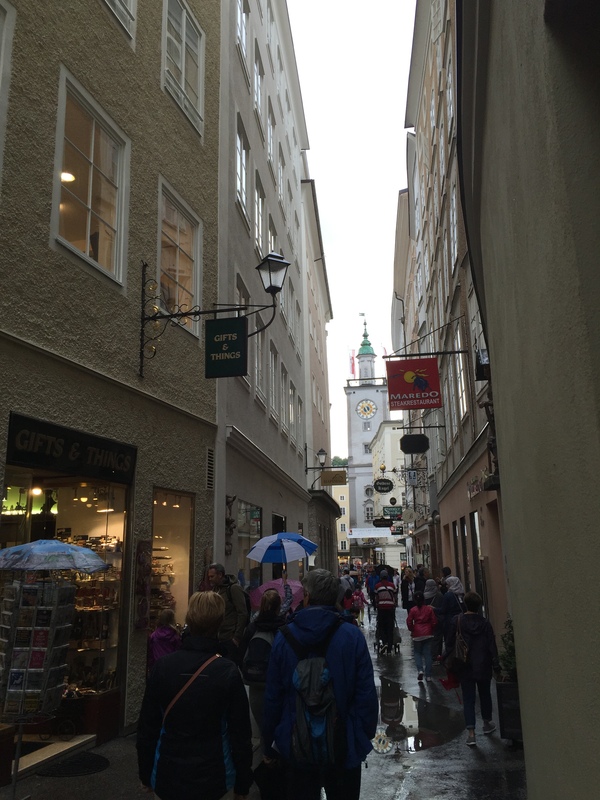 After spending a few hours in the Hohensalzburg Castle we went back down into the city and spent a bit more time exploring the narrow streets and surrounding area. There are various other sites and museums in the city but unfortunately they were all closed by the time we finished in the castle. View of the narrow streets in the old city. View of the old city from along the river. Before getting the car to leave the city I also noticed something else pretty interesting. 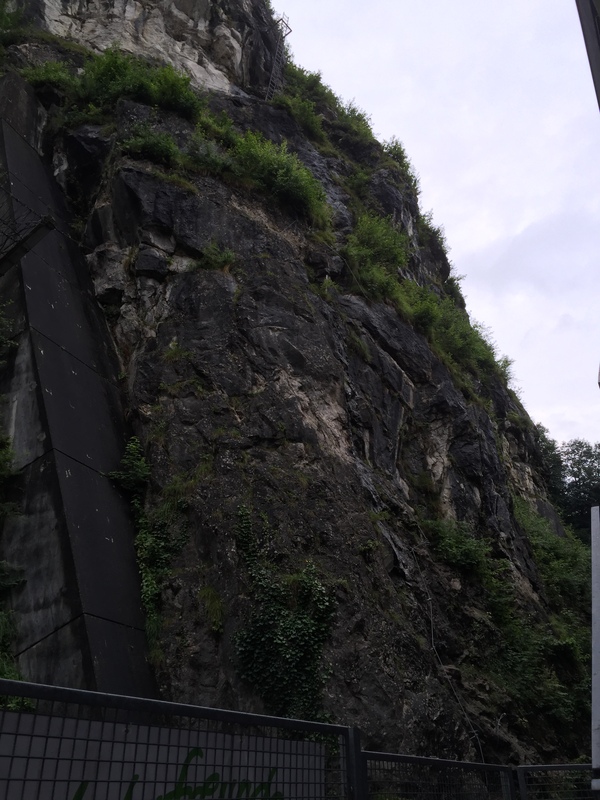 The parking garage was built into the side of the mountain and right before the entrance to the garage was the start of a via ferrata route up the mountain. I had never seen one right in the center of a city like this and it was even more interesting that it was marked out in so much detail right there for everyone to see. I wish we would have had time to climb it but it was still fun to see. Sign at the start of the via ferrata. Start of the via ferrata. 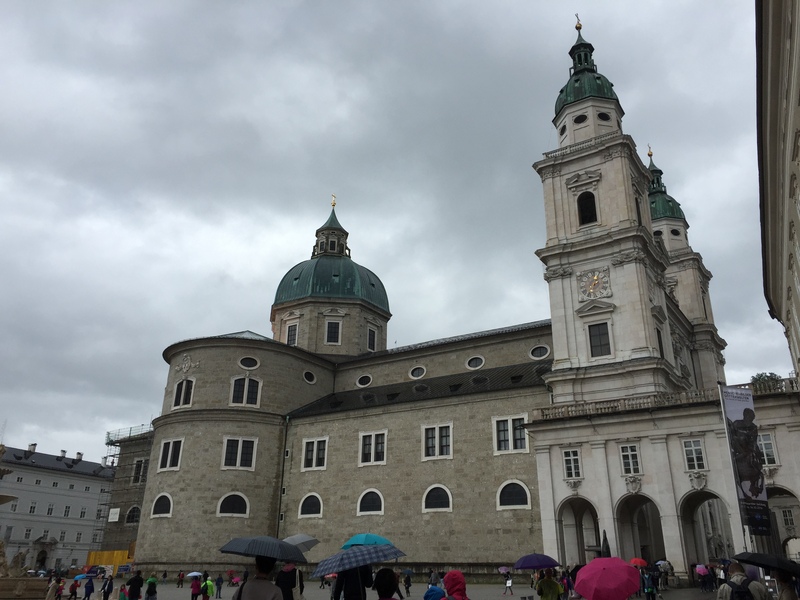 We only spent a short time in Salzburg but it was very enjoyable despite the bad weather. It is a beautiful city with a lot to see and I would be happy to get a chance to visit it again in more detail. It has a little bit to offer for everyone which makes it a great place to visit if you are traveling through the area.